Her sister-in-law, Mrs. Rebeccah Puddle-duck, was perfectly willing to leave the hatching to someone else-- "I have not the patience to sit on a nest for twenty-eight days; and no more have you, Jemima. You would let them go cold; you know you would!" But--seated upon the stump, she was startled to find an elegantly dressed gentleman reading a newspaper. He had black prick ears and sandy colored whiskers. "Quack?" 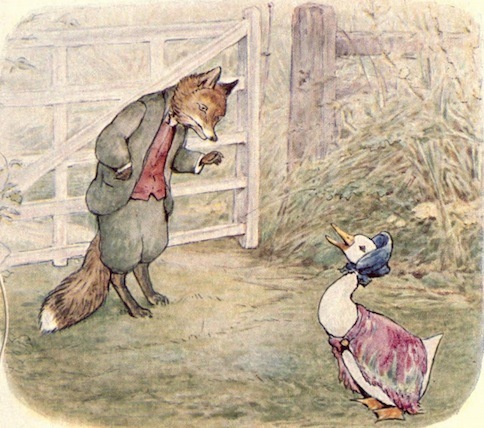 said Jemima Puddle- duck, with her head and her bonnet on the one side--"Quack?" "But as to a nest--there is no difficulty: I have a sackful of feathers in my woodshed. No, my dear madam, you will be in nobody's way. You may sit there as long as you like," said the bushy long-tailed gentleman. When she came out, the sandy- whiskered gentleman was sitting on a log reading the newspaper--at least he had it spread out, but he was looking over the top of it. "May I ask you to bring up some herbs from the farm garden to make a savory omelet? Sage and thyme, and mint and two onions, and some parsley. I will provide lard for the stuff--lard for the omelet," said the hospitable gentleman with sandy whiskers. A moment afterward there were most awful noises--barking, baying, growls and howls, squealing and groans. 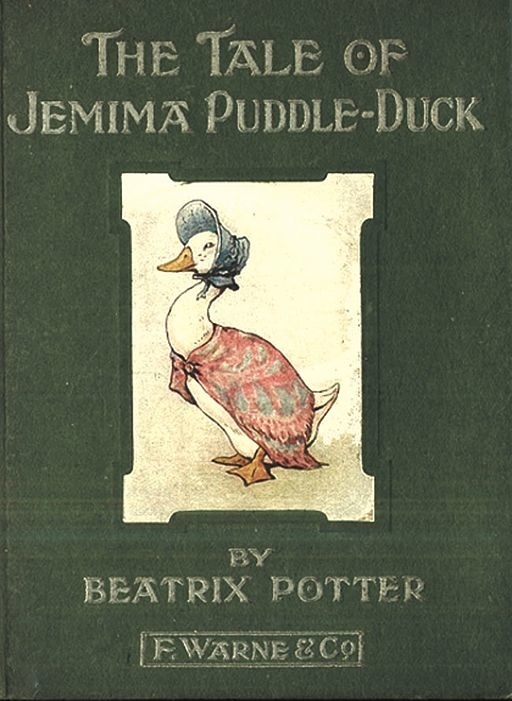 Add The Tale of Jemima Puddle-Duck to your own personal library.